I was over the moon excited when I received my subscription box from Keto Delivered. I’m talking Christmas morning excited, you guys! The only thing I ever get in the mail is bills and silly stuff I order from Amazon now and then… not mysterious packages with goodies tailor-made just for me. Everything in the box was a complete surprise. I swear this was the coolest mail EVAR! When I opened it to discover Stacey Hawkin’s Garlic Gusto spice blend, I immediately rushed to the fridge to find something to make with it. There it was: shredded chicken. 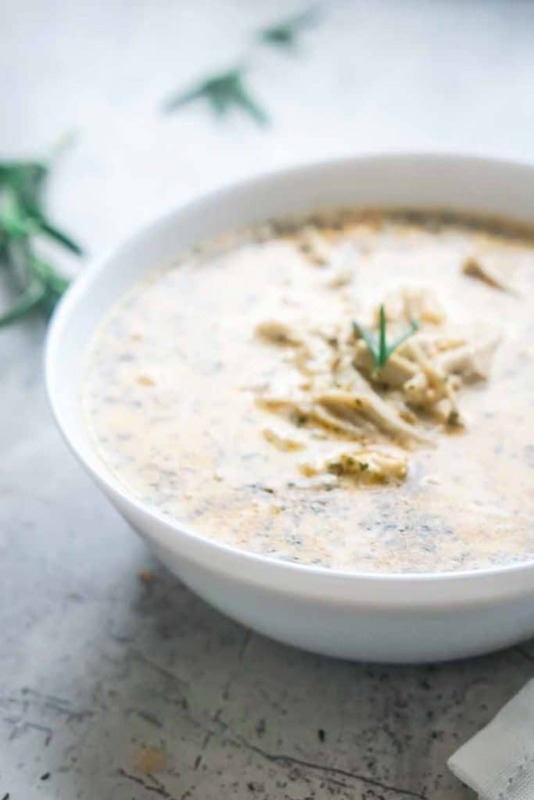 Creamy garlic chicken soup was the logical next step. I have a thing for shredded chicken. Seriously, it’s always in the fridge ready to go. 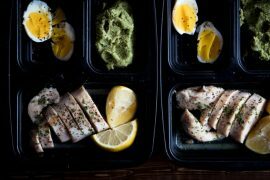 Having pre-cooked protein stocked in the fridge is the secret to successful meal planning; it just makes life a little easier when one of your main ingredients is already taken care of. 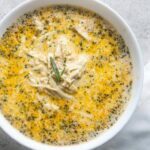 My shredded chicken chili has been a huge hit here, so I know you guys will just love this! 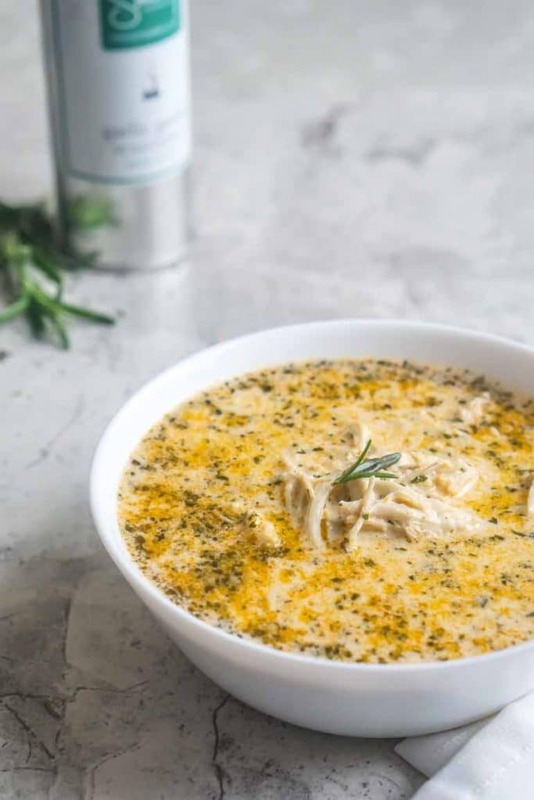 This creamy garlic chicken is one of the tastiest soups this blog has ever seen. Prep once, eat for a week! Get my FREE meal mapping strategy with shredded chicken recipes! 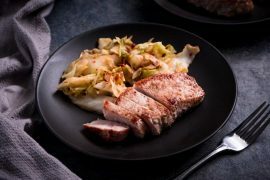 See how I map out my weeknight dinners with this one simple prep step! It's my secret to getting dinner on the table every night without the hassle. 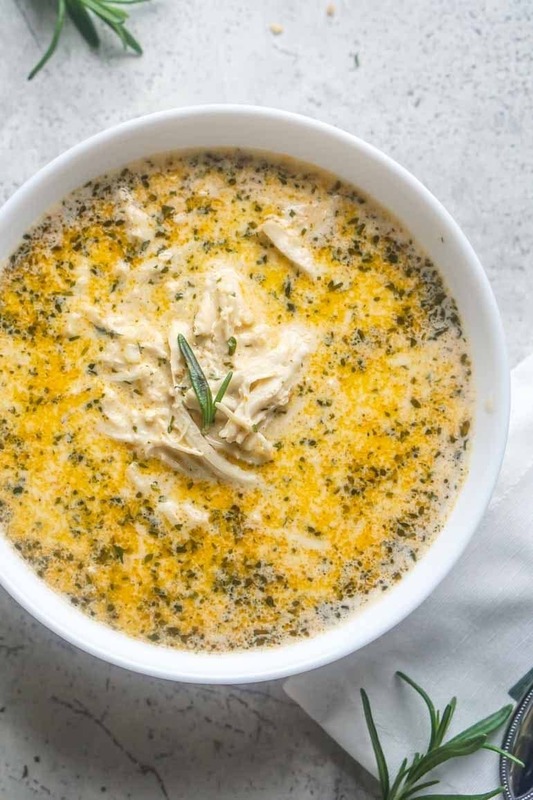 Make an entire week's worth of low carb dinners with shredded chicken! To prepare the creamy garlic chicken soup, I heated butter in a saucepan and added the shredded chicken. Once the chicken was warmed and coated in butter, I added the cream cheese to the pot and mixed as it melted over medium heat. Next, chicken broth and a bit of heavy cream were added in and brought to a boil. Just reduce the heat to low and simmer for several minutes to finish it off. Boom. Done. This post is not sponsored, but Keto Delivered did send a box my way for consideration. I loved their product so much I became an affiliate. If you purchase a subscription through one of my links, I’ll get a small commission used to grow the blog. Thanks for your support! A warm, comforting soup that's sure to satisfy even the pickiest of eaters. Add shredded chicken to pan and coat with melted butter. As chicken begins to warm, add cubes of cream cheese and Stacey Hawkins Garlic Gusto seasoning. Mix to blend ingredients. Once the cream cheese has melted and is evenly distributed, add chicken broth and heavy cream. Bring to a boil, then reduce heat to low and simmer for 3-4 minutes. The garlic gusto seasoning is a combo of mainly parsley, garlic, onion, lemon peel, and paprika. Hello! I found your site today and decided to subscribe to it, you have a wonderful blog! is there a way to disable that feature for people who already subscribe to your site? Oh no, that’s no good! Sorry about that, I’m going to look and try to disable that altogether. Thank you for pointing that out, I had no idea! Oh, I am glad I mentioned! I realize that when we own the site, a ton of stuff doesn’t pop up because we are the administrators… I hope it’s an easy fix. Also it might be interesting to ask a few of your old time subscribers -maybe it could be something linked to Safari and a MacBook Pro? Maybe Chrome would act differently? This sounds so easy and tasty! what spice combination would you suggest if I don’t have the gusto garlic seasoning? This looks amazing! I can’t wait for cool, fall weather to arrive so I can try it. This looks utterly amazing! I literally want to reach into the screen and grab a spoonful. I love how simple the ingredients are, too. Wow! This soup sounds so delicious. 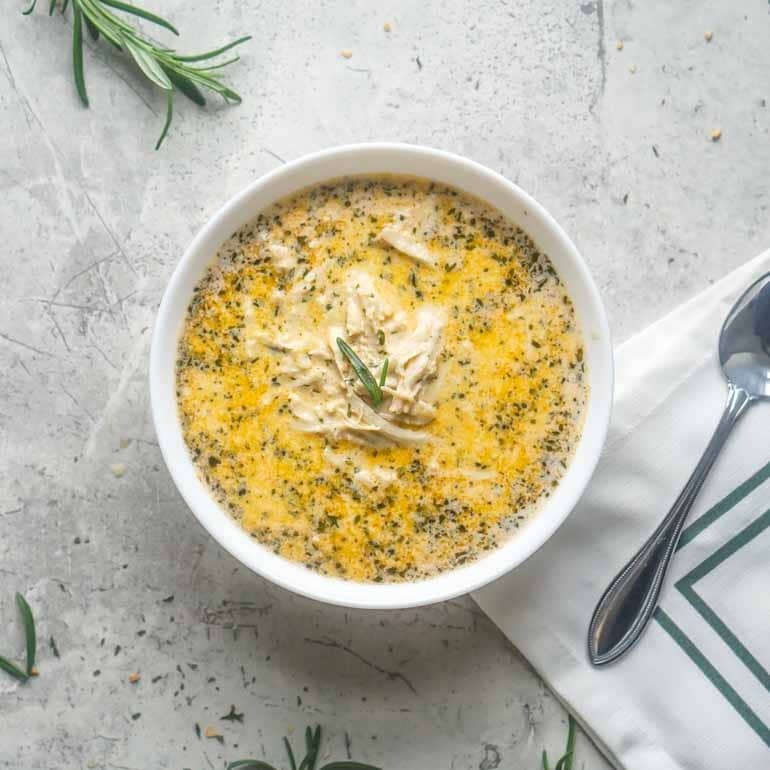 My family loves soup – even in Summer – and I’m all about the shredded chicken, too. Thanks for sharing! Hi! This looks amazing. Is there a substitute you recommend for the Stacey Hawkins Garlic Gusto Seasoning? The main ingredients of the spice mix are parsley, garlic, onion, lemon peel, and paprika. If you don’t have the spice mix, I would start with garlic and onion powder to replace for the main base of the flavor. There’s a very strong garlic onion flavor. If you have parsley, paprika or lemon peel on hand you could add those in and adjust to suit your taste. Hope that helps! Hello Tasha. I am so glad that I subscribed to your site. 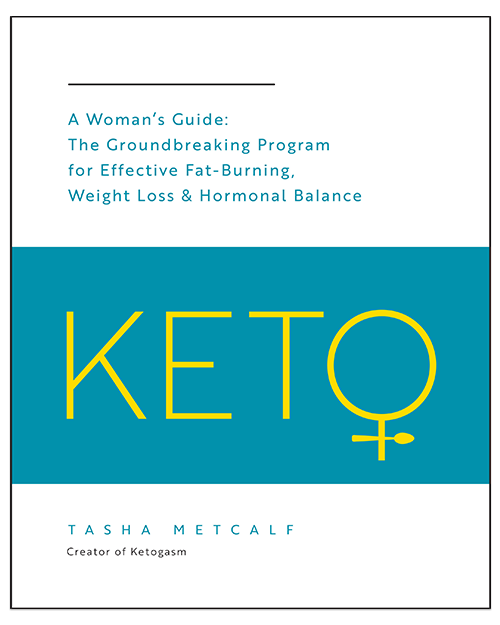 My daughter and I have just started living “keto” and we are actually enjoying all of the recipes and the time we spend cooking together. I have lost 6 lbs in a week and she has lost 8. I thank you for the interesting info and yummy recipes. My daughter’s favorite food WAS Tostino’s Pizza Rolls and your substitute with the Fathead Pizza Rolls saved her from the cravings. Thank you! Thank you! Thank you! Della, you have no idea how happy that makes me! I have a young daughter and one of my favorite things in the world is spending time cooking together. I’m so glad you two are enjoying your journey together and making it fun! Thank you for sharing, you put a big smile on my face today. This is our weekly favorite now! Ordered the Garlic Gusto Seasoning around Christmas time…but just got around to making this soup! “Souper” easy to throw together and so good. Sticks to the ribs. Looking forward to bringing it to work next week for lunch. This sounds so good. Would freeze ok? This sounds so good. Would it freeze ok? Hi! What is the serving size on this? I made this tonight! I was rushed and the only thing I had on hand was a rotisserie chicken, so I thought soup would be an easy meal. This was delicious! And so fast! My husband couldn’t believe it was ready so quickly, and so full of flavour. Thank you so much, I’ll be trying more of your recipes for sure! Have you ever frozen & reheated? With school starting I’m looking to have something made ahead of time I just need to heat up on the stove. Found this recipe this past weekend and decided to give it a shot. It is by far one of the best soups I’ve ever made/eaten. I added mushrooms and diced onions (softened in the butter before adding the chicken), and used minced garlic, lemon juice, dried parsley, and sweet paprika instead of the seasoning mix in the recipe since I don’t have any. Will definitely be adding this to my dinner rotation. You are so very welcome! Thank you for the kind comment, you put a big smile on my face. I’m really glad you enjoyed the recipe. P.S. I love the idea of adding mushrooms to the soup, what an excellent addition! I didn’t have the specific seasoning mix this called for but I read what you said it mostly consisted of (thanks for that guidance) and got to work. 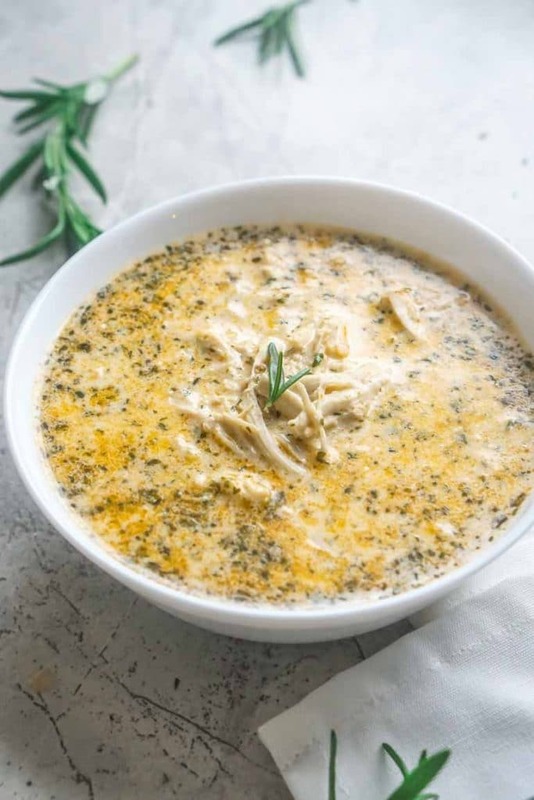 I used the chicken broth, cream cheese, butter, and then added minced garlic, parsley, a little paprika, a little extra powdered chicken broth for flavor, lemon pepper seasoning and lemon juice. Oh my gosh, the broth was amazing. I then added chopped celery, pearl onions, and riced cauliflower in with the chicken. This is the best soup recipe. I obviously added a little to it, but I followed the main idea. My husband even likes it, and he’s not on my diet. Thanks so much! Will be making more of this!!! Hi Tasha, what could I substitute the heavy cream with? I am currently breastfeeding and my daughter doesn’t handle the lactose in heavy cream very well through my milk. 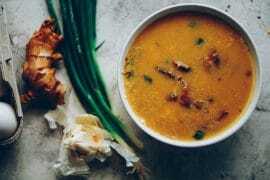 I haven’t tried it with this specific recipe, but I love using coconut milk in soups. I think it would actually work really well here and is dairy free. You could also try almond milk, but I’m afraid it wouldn’t be as thick and creamy as the other option. Hope that helps! Thank you so much for this recipe! I made it this afternoon and it was super delicious! Me and our husband are new to Keto so thank you making the transition flawless even in 2018! To confirm, the serving size in the nutrition facts is for the entire pot? The nutrition labels are for one serving. It totals all the ingredients, then divides it by number of servings. For this recipe, it would be 1/4th of the whole recipe since the recipe makes 4 servings. Hope that helps! Thank you! I just needed the confirmation before I made it. 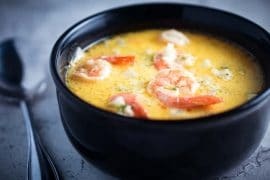 This has become my go-to soup recipe! It’s delicious and very simple to make. I’ve been sick the past couple of days and have pretty much been living off it. OMG! This soup is delicious! I didn’t have the right spices so I used “Spice Island’s Organic Garlic & Herb seasoning” and it came out perfect. I bought the seasoning at Costco. Thank you so much for the recipe. It’s my new favorite! Trying to track this in my macro counter…about how much is a serving? I used garlic herb Mrs. Dash for my seasoning. I also added 1 cup of brocolli and about an 1/8 sharp cheddar. This soup is amazing! 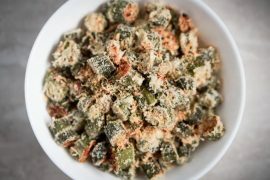 I love that eating a keto diet is so yummy and filling! Thanks for the great recipe! Made this tonight and it was absolutely amazing! I doubled the recipe and it made enough for a family of four with enough left over for lunch tomorrow! I used garlic powder, salt and pepper to season since I didn’t have the seasoning mix you recommended! Will make again very soon! I never comment on recipes, but this one I had to! I just made and man it was quick and it tastes soooooo good!!! I am so glad i decided to try it out. I will definitely keep and make this again!!! This was amazing! I did do what someone else did. I added some broccoli and shredded cheese. Then I cooked it in the Instant Pot for 8 minutes! The only problem I had was it was so yummy I ate too much and now I probably gained weight. Hi, this soup is so delicious! It is good to freeze? I haven’t personally tried freezing it, so I’m not 100% sure. I know that heavy cream freezes well, but lighter creams don’t really hold up once they are frozen. The soup has a relatively high fat content, so my guess would be that it would be possible to freeze and reheat for later. This soup is lick-the-bowl good! I had 2 servings (I had the room in my macro budget) and wished I could hold more! Ok, fan girl rave over. Made this soup tonight, so quick, so easy, so delicious. Will definitely be a go-to keto dinner often. Thank you! Love the site Tasha! This is one of my favorite recipes I keep coming back to. I Add broccoli & cauliflower and sometimes a few punches of shredded cheddar too sometimes. DELISH! Thank you! This soup is absolutely delicious! My husband and two young children loved it as well. My husband demanded that I make it the next day as well and double it so we can have leftovers. The second time I made it I also added some steamed broccoli. And the third time I made it instead of chicken I did it with Italian sausage, and it tasted like Zuppa Toscana. Just need to add kale. 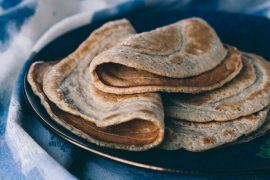 This recipe is so easy and quick to make, it is definitely going to be in a regular rotation at my house. Thank you! LOVE this soup! I had some left over roast chicken and this was the perfect recipe to use it up! I am going to have to purchase the gusto seasoning, but in the mean time I used garlic, onion, lemon pepper, and parsley and it was perfection! This soup is going to be in my regular rotation! Fantastic with crusty bread and a side of kiwi fruit and almonds. Made this three times just before and during the polar vortex. Next time may try baking in the oven with dumplings using the dumpling recipe from the British mince and dumplings recipe by John Lockwood. This is my absoulte favorite recipe. I make this at least once a week. I’ve been adding different veggies. Even my dad who’s not a fan of garlic loves this. It comes together so quickly. It keeps me full for hours.